Captivating & Curious was designed to celebrate the 25th Anniversary of the National Museum of Australia Act (1980) which led to the establishment of the National Museum and its opening in 2001. 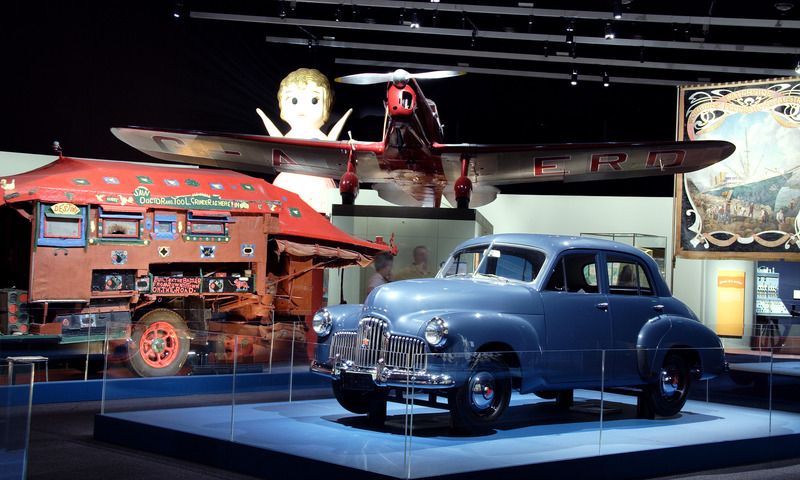 The exhibition showcased over 450 objects from the National Historical Collection (NHC) featuring the museum’s core collection of Australian historical material; many of which had never been displayed before. Items included Indigenous bark paintings and breastplates, convict love tokens, racehorse Phar Lap’s heart, a tinker’s Saw Doctor Wagon, historical vehicles including Holden prototype no.1, an aeroplane and Bettie a giant kewpie doll , part of the 2000 Olympic Games Collection. These disparate items were collected under approaches such as comparative anatomy, social history and ethnography. The exhibition was drawn from the objects in the NHC rather than using the objects to explore a historical theme or idea. By focusing on key objects in the collections the activity of collecting was highlighted. To draw visitors into the gallery from the main hall into the temporary exhibitions space a spine of open storage racking enclosed with acrylic sheeting was used. The racking was identical to the racking used at the Museum’s warehouse in Mitchell and is of the standard blue and orange steel finish. Accession tags and bar codes were left on the objects alluding to an experience of going behind the scenes into the stores of the museum. Mixed in with this utilitarian design language were traditional wooden display cabinets which had come from the Institute of Anatomy one of the foundation collections of the NHC. These displays were used to hold anatomical wet specimens collected by the institute’s first director who was interested in comparative anatomy. Captivating and Curious has been described as one of the most successful temporary exhibitions ever held by the National Museum of Australia.